Other features include multi-badge communication via a wired interface and a static serial bootloader for in-the-field firmware upgrades. Source code was developed using the freely available CodeWarrior for 56800/E Digital Signal Controllers. A single CR2032 3V Lithium coin cell battery provides the required power. 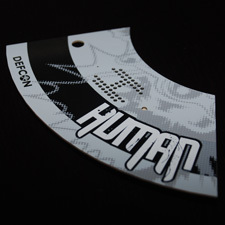 A total of 6,694 badges were manufactured with a unique badge shape used to denote each type of DEFCON clientele: Human, Goon, Press, Speaker, Vendor, Contest Organizer, and Uber (awarded to the winners of official DEFCON contests). Each shape serves as a puzzle piece and the puzzle can be completed by placing the seven badges in the correct positions. 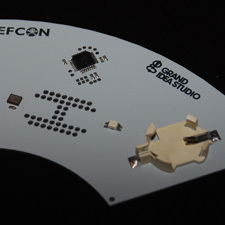 Grand Idea Studio once again hosted the DEFCON Badge Hacking Contest to award the most ingenious, obscure, mischievous, or technologically astounding badge modification created during the weekend conference. There were 32 official entries in this year’s contest. The winning entry by Zoz was a two-part anti-surveillance system: Defeating automated facial recognition by generating alternating colors and patterns of light in order to create optical noise and aiding in bypassing motion detection by measuring ambient temperature and guiding the user as to how slowly to move through the room. 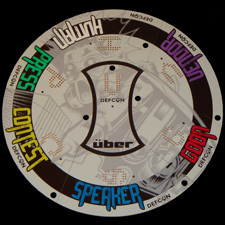 Additional contest information can be found at the official DEFCON 17 Contest Results page.